President Rodrigo Duterte on Wednesday said he will order the “mass arrest” of National Democratic Front (NDF) consultants, who were released temporarily, following the collapse of the peace talks with the communist rebels. “For those who are out temporarily, you just maybe zero in now, because any day, I will order for their mass arrest. Wala akong magawa eh. 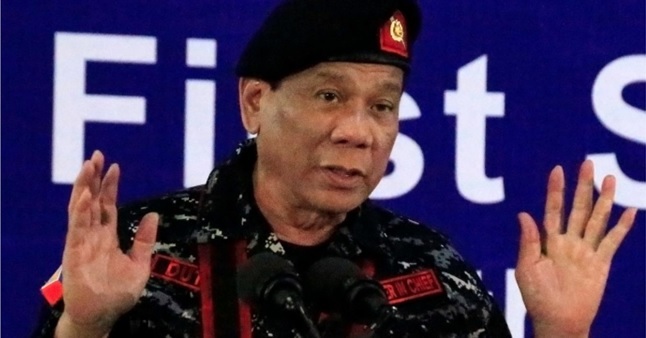 Ginusto ninyo (you wanted it), I’m addressing them through the TV, ginusto ninyo eh,” Duterte said in a speech during the oath-taking of newly-appointed generals and flag officers in Malacañang. “I gave too much, too soon. I know ‘yung police, military medyo may sentimyento sa akin. You know, I released almost about 32, just… ‘yung Tiamzon na spouses,” he said. Around 20 NDF consultants, including Communist Party of the Philippines (CPP) leaders Benito and Wilma Tiamzon, were granted conditional liberty so they could participate in the peace talks. Duterte’s announcement came a day after declaring the CPP and New People’s Army (NPA) as terrorist organizations. Duterte told the military officials that the communists eventually want a coalition government, which is something he cannot give. “So they are now considered ordinary criminals. And so if they ambush you, that’s murder, multiple. If they use an explosive, use of explosive is always a murder, then it’s no bail for everybody,” he said. President Duterte told military officials to expect a longer war of attrition with the CPP-NPA-NDF. “But kung matapos natin (if it’s finish) during my term, I will be happy. But I am not talking to them anymore,” he said. He said that he is not ready to go back to the negotiating table even if the Reds are now the ones demanding for the resumption of the talks, adding that he will not insult them by speculating on the sudden turn around. “Well, you might be ready now, not before. Ang problema, ako na ang ayaw na rin (The problem is I myself don’t want it anymore) because I said — Not to win a thing, I concede to your brilliance or whatever, you are the ideologues. But then the simple matter is really a sovereignty is owned by the Filipino people and nobody else,” he said. He also accused them of “impunity” for waylaying everybody, including innocent civilians. Duterte terminated peace talks with the communist rebels following a string of violent attacks against state forces despite ongoing peace negotiations. The last straw was when a police vehicle was ambushed by alleged NPA rebels in Bukidnon last November 9 that resulted in the killing of a four-month old infant in a nearby vehicle. “You want to fight the country, create a revolution? Fine. We have been fighting you for 50 years and we will fight again for another 50 years. That is what you want,” the President said. He said that he is ready to implement the rule of law by first ordering their arrests, adding that the government is ready for any eventuality should the rebels resist. “You always insist on the rule of law. We will follow the law. And if you don’t, then the simple thing is to arrest you and place you in prison,” he said.